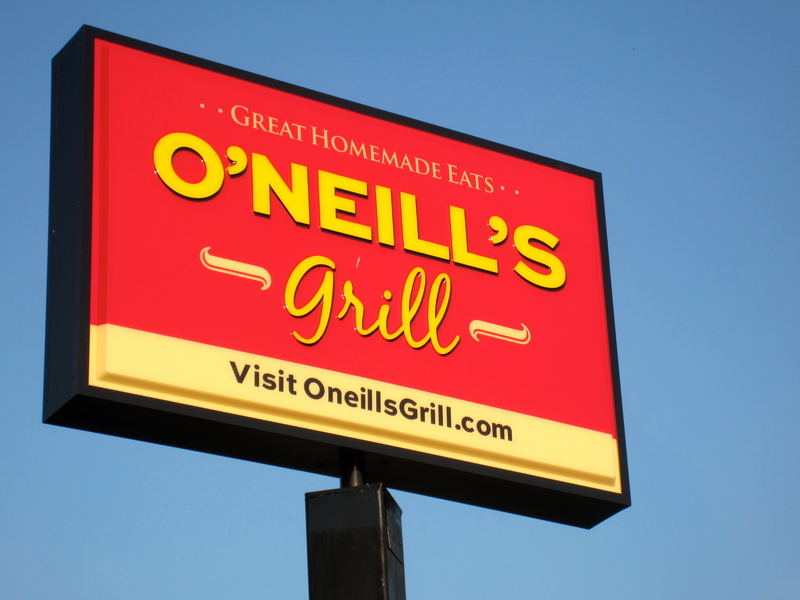 If you’re looking for a great local place to eat where you don’t have to worry about getting a hefty bill at the end of the night, then head on over to O’Neill’s Grill! Just like it says on the front of their menu, O’Neill’s food is “freshly homemade…so it’s delicious every day!” And I couldn’t agree more. My boyfriend and I decided on checking out O’Neill’s Grill for one of our date nights since we had never been before. And since we both have the budget of a typical college student, we loved that we both had a wide variety of sandwiches and wraps to choose from for under 8 bucks! And the meal also comes with one of their delicious, homemade sides. Some of the sides include homemade mac & cheese, seasoned sweet potato fries, cajun rice, and homemade coleslaw. For my meal, I got the Kickin’ Chicken sandwich with fries and absolutely loved it! 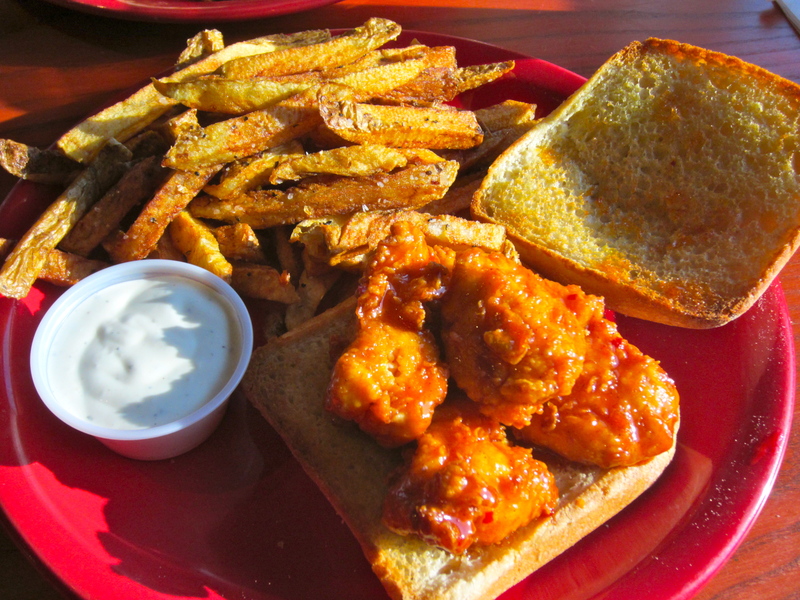 The sandwich included a fresh hand-breaded chicken breast, fried golden brown and dipped in their original barbecue sauce. You can choose from a variety of their sauces, ranging from mild to very hot, but since I’m not a fan of really spicy things, I went with one of the more mild sauces. The chicken was served on a warm ciabatta roll with ranch dressing. For dessert, my boyfriend and I decided on splitting a cookie skillet. 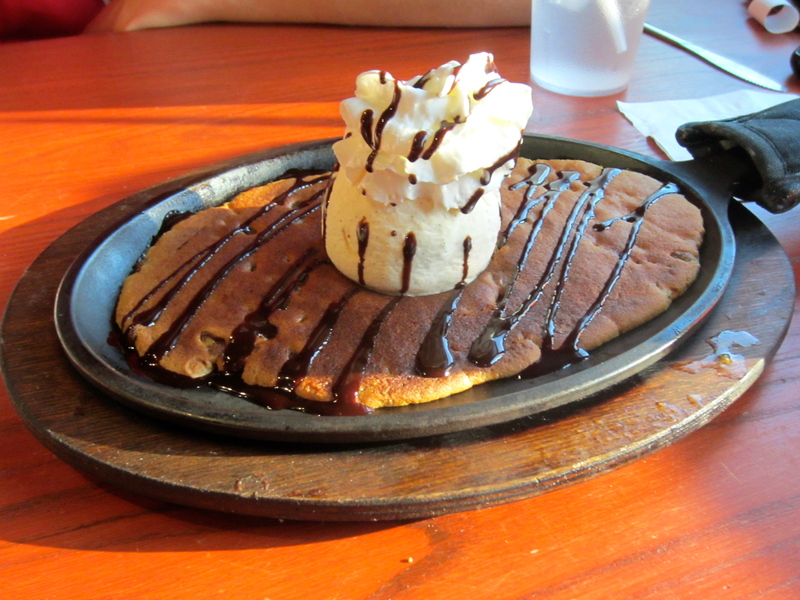 Now if you’ve never had a cookie skillet before, you’re truly missing out. My friends have raved to me about the cookie skillets at O’Neill’s multiple times so I knew that I had to get one before we left. Now if you don’t know what a cookie skillet is, let me paint a picture for you. It’s freshly baked chocolate chip cookie dough served hot and gooey topped with vanilla ice cream, whipped cream, and chocolate sauce. When I was eating it, it was like heaven in my mouth. And for under $5, it’d be a sin not to get one! So with O’Neill’s Grill being only about a mile from JMU’s campus at 221 University Boulevard, you should definitely stop by because their food is not something to pass up! And don’t just take my word for it, check out these reviews from other O’Neill’s customers! Love that you included a poll to make it even more interesting! Oneill’s Grill is actually owned by the same people that owned Hams. They just changed the name and some of their dishes, but essentially it’s the same. Still great food though for a decent price! I have to take the time right now to gush about the cookie skillet. Never in my life have I wanted to marry an inanimate object more. It is what I would imagine eating gold tastes like. I wouldn’t even be surprised if there was raw egg in it, and I would still risk my life to eat it. If anyone hasn’t tried it yet, please drop what you’re doing right now and go get one. If you are still reading this, I’m obviously not getting through to you.